So your car doesn't have the power hatch release option? You want it? Let's do it. 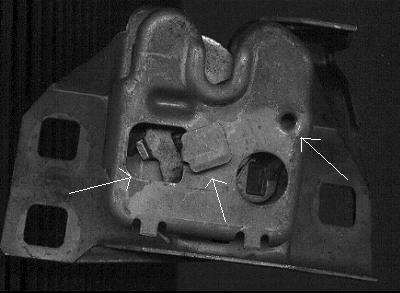 First off go to a junk yard and go get a power hatch release actuator (basically a solenoid) from a car that has this option. It is located in the rear of the car behind the plastic trim piece. Take out those huge plastic screws and one screw on top of the plastic to remove it. Now you can see the latch itself and the actuator. The latch looks like this. The actuator is connected by a cable to the latch. Simply unscrew the cable from the latch being sure to save that screw. Then unbolt the actuator from the bottom of the latch. You will not need the latch itself, unless yours is broken. You may want to also grab the trunk release switch from the dash board, and the cover plate that covers the option switches, make sure to get the connector for the switch. The switch is located above the center console on the dash panel. Now that you have a actuator and the switch you are set to install it on your car. You will have to run a wire from the actuator to a switch. If you took the factory switch off the junk car place it in the location it was in before and wire it up. You need to hook this switch to a un-switched (battery) positive source.